John Ford may be one of the most celebrated and respected of American directors, and his reputation continues long past his death. Even his four Oscars for Best Director (The Informer, The Grapes of Wrath, How Green Was My Valley and The Quiet Man) still seem justified. But author and film scholar Joseph McBride still believes Ford hasn't quite got his due. 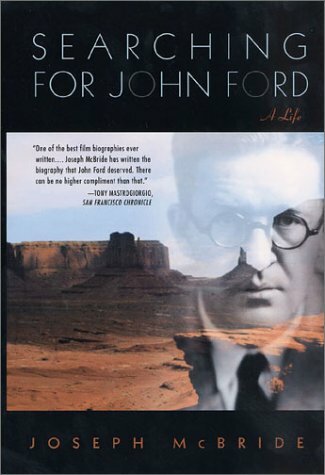 In his new book "Searching for John Ford: A Life" (St. Martin's Press, $40, Hardcover) he attempts to reconcile the man and the artist. Born a hard-nosed Irishman, Ford was never able to come to terms with the fact that he was an artist, and so he covered up for this dual nature by acting like a jerk. During his many years of research, McBride only spent an hour with John Ford before the director died in 1973. Going further into depth than even previous Ford chroniclers Peter Bogdanovich and Lindsay Anderson, McBride still manages an astonishing portrait of a confusing, aggravating and astonishing man full of contradictions and conflicts.